some unknown offense, the master class is scheduled for 9am on Tuesday, March 27 2012 at 9am…..
Its open to the public. just email me I will put you ‘on the list’ plus none…. In a nutshell: the thought process behind this ‘convergence theory’ is mixing the ‘techniques’ of composition, orchestration, sound design, audio engineering, 5.1 and x,y,z/3-D surround mixing, digital video recording and processing, digital video editing and codec-centric file creation in conjunction with cellular/live animation, live ambisonic audio mixing, live video remixing in a circular and spherical visual projection to ‘compose’ a singular or unique ‘inclusive and immersive hyper-world’. When minds of different creative directions collaborate, there is a collective diffusion that improves the idea and has the potential for further investigation and elaboration. 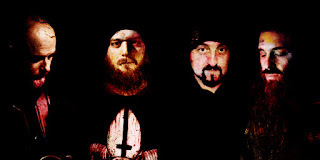 Herewith a preview track, King Cockroach, from the forthcoming eponymously titled Metallic Taste of Blood album, which is a collaboration between (left to right below, Eraldo Bernocchi on guitars and electronics, Balazs Pandi on drums, your humble narrator here on bass/electronics and Jamie Saft on piano and various keyboards. Release date for the album has been confirmed to me as early May 2012, on Rarenoise Records. Global MicroJam – Shape of Jamz to Come? we would like to share a very interesting article, appeared in Fusion Magasine, relating to RareNoiseRecords’ future release “Planet MicroJam” by David Fiuczynski. At the crossroads of African American rhythms, microtonal harmonies, and eastern melodic inflections and improv concepts – in other words all the elements that the Greater Boston area has to offer with Berklee as its base – new musical ideas are on the horizon. Drawing on unique elements of western classical microtonality and ethnic folk melodies organized in a jazz/groove context, unheard of harmonies and counterpoint are possible. What sets this microJam apart from other microtonal music is its method of organization. Unlike the microtonal chromaticism of Julian Carrillo, the athematicism of Alois Haba and the post-Scriabin style of Ivan Wyschnagradsky (all venerable microtonal pioneers in western classical music), this MicroJam is not so much MICROtonal as microTONAL. The emphasis is on microtonal harmony that has a jazz-based modal origin. New harmonic colors can be expressed vertically through the stacking of, for example, an Arabic maqam (a type of Arabic mode) into chords based on 3rds or 4ths over a tonal center – in other words, harmony derived from a microtonal chord scale. This is not done in eastern music traditions or modern classical music. Music from the Middle East and Asia rarely has chordal harmony and in the modern western classical tradition, either tonal centers are avoided or harmony is produced from counterpoint. In our ever-shrinking global village could Global MicroJam be a shape of Jamz to come? My particular bent is a sound that is raw with simple but rich ingredients like a Gauguin painting – a raw, powerful, extremely colorful mix of eastern and western elements. I was initially attracted to microtonality through “eastern blue notes” – the heart-wrenching pitches in an Arabic call to prayer that are outside of our 12-tone equal temperament just like our very own blue notes that one cannot find on a piano. Most of these scale tone gems are roughly a quarter-, sixth- or eighth tone off of our tuning system. With new microJams (or microGems!) in 24, 36, 48 and 72 note per octave equal tempered systems (and eventually also in just intonation), I would particularly like to feature African American rhythmic innovations from the gospel church and modern RnB. For me, these beats always induce a feeling of inexplicable hope. My Global MicroJamz will highlight African American rhythms in a new way and underline the debt we owe to this craft. Often it seems that Black music is taken for granted and anyone can appropriate anything without giving credit to its creators. Also, within this Global MicroJam concept I would like to introduce concepts of “open form,” “Seyir,” and “Jor.” Within open form a soloist can cue different sections at will and not be boxed in by a preconceived solo form. Jor is the section from an Indian raga after the rubato introduction (alap) and before the metered composition (gat). Jor is playing in pulsed time recapping the material introduced in the alap. I’ve seen heightened creativity when soloists and rhythm sections are untethered from time signatures and can freely express themselves. Seyir is the Turkish concept of unfolding a makam – a pitch set with melodic rules. These concepts force improvisers to shape their solos, but in a freer manner that still draws on the motifs of the composition at hand. But why microtonality now? The study of microtones is important. Composers like Schoenberg and Busoni, historians like Robert Morgan (author of “20th Century Music”) and more and more musicians are asserting that our 12-tone equal tempered language is exhausted. It’s a surprising statement Schoenberg made before he invented his 12-tone technique. Also interesting is his prediction that microtonality will establish itself “when its time has come.” I believe the time for microtonality will come once an affordable microtonal keyboard is available along the lines of a Starrlabs keyboard. This will make microtonal harmonies much easier to play and will encourage new microtonal pieces because the keyboard is still an extremely powerful compositional tool. Berklee could be a real pioneer in this context. After all of my travels and tours in Japan, the US and Europe, communicating with microtonal societies (American Festival of Microtonal Music in New York, the UK Microfest in London) and with composers in Australia and Germany, fans in Thailand and Argentina, and surfing online, I have not come across anyone melding these elements in an improv/groove context. When a new movement or style commences, it is usually outside the academic context, and eventually music schools start to slowly incorporate the new ideas into their curriculum. Here’s an opportunity where Berklee could lead the way with innovative MicroJam classes and could thereby influence the music industry. In the process, Berklee would be helping to create a new musical language reflecting our immediate access to all musics in our ever-shrinking global village. David Fiuczynski is Associate Professor of Guitar.